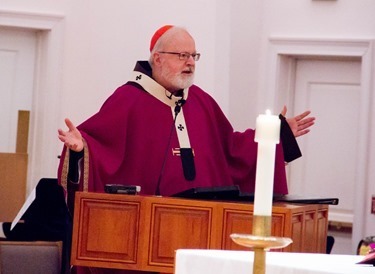 Yesterday, we received the news of the unexpected death of Cardinal Edward Egan, the former Archbishop of New York, and I have spoken with Cardinal Dolan to tender my condolences. 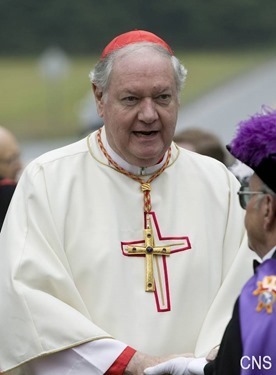 They were in the midst of the severe snowstorm in New York City when Cardinal Egan had a heart attack and was rushed to the hospital. He had a long and fruitful life of ministry and we commend his soul to God’s mercy through the intercession of Our Lady. His many contributions to the life of the Church will live on after him, and his friends and former parishioners hold him up in prayer as we prepare for his final farewell at St. Patrick’s Cathedral. 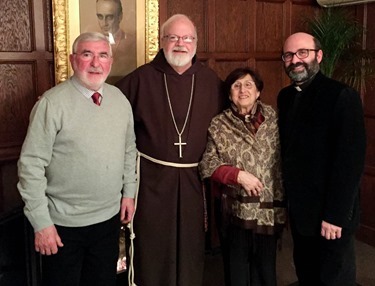 This week I was delighted to see that four leading national Catholic publications came together to cosponsor a recent editorial on capital punishment, because it really is an issue that is part of the Gospel of Life and is important for us as Catholics. I would like to share with you my pastoral letter on capital punishment that I wrote when I was Bishop of Fall River. I want to share these thoughts with you again because when dramatic cases come up people can have an emotional response rather than a clear and ethics-centered analysis of what is at stake. 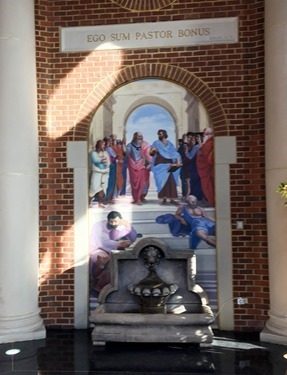 On Friday I went to Northern Virginia for a gathering at Christendom College where a dozen Catholic college presidents, including the president of Catholic University of America, came together to discuss Catholic higher education in a gathering called the Ex Corde Ecclesiae Presidents Roundtable. 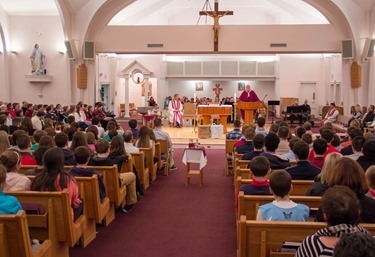 I was asked to give a keynote address and celebrate Mass for the group. 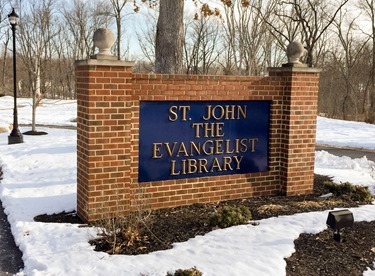 We met at St. John’s Library on Christendom’s very beautiful campus in Front Royal. 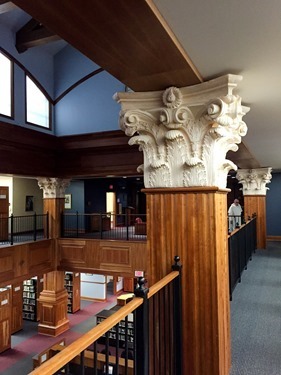 The architecture of the library is very striking and the dome is very reminiscent of the Duomo in Florence. 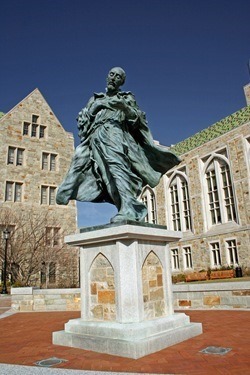 The library contains many symbols of St. John. 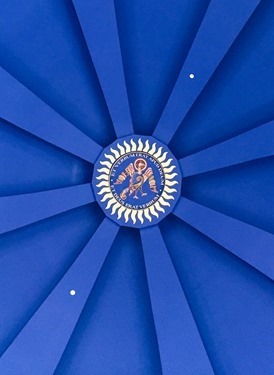 On the blue ceiling we see the eagle, representing St. John. 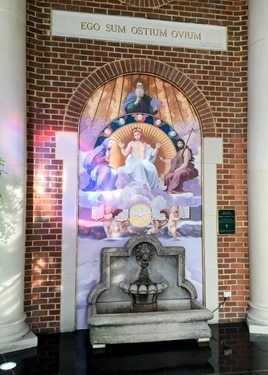 There are fountains with quotes from St. John’s Gospel. During our gathering we had the opportunity to talk about Pope Francis and his vision for the Church. 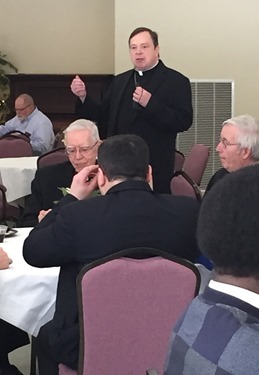 It was a very positive meeting and it was very encouraging to see the desire of these Catholic college presidents to be faithful to the Church’s mission of transmitting the faith and the Church document Ex Corde Ecclesiae. Saturday evening Father Carlos Flor, who is pastor at three parishes in Jamaica Plain and Roxbury, stopped by the cathedral. With him were his parents, Carlos and MariCarmen who were visiting from Spain. Since it was close to dinner time, we invited them to stay and join us. 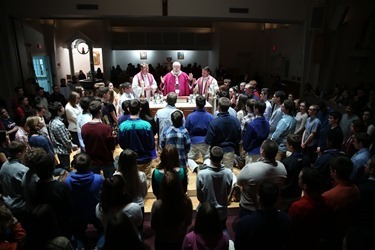 Sunday was Appeal Announcement Sunday and I went to celebrate the 6 p.m. Mass at St. Mary’s Parish in Hanover for their Life Teen group. 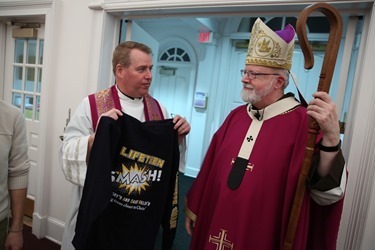 Father Chris Hickey is the pastor there and they have a wonderful Life Teen program that they call “Life Teen SMASH” because the Hanover collaborative is St. Mary’s And St. Helens Parishes. I thought it was a very creative name! Despite the snow storm, we had a full church of about 800 people. It was a very moving experience. The young people were very devout and showed great enthusiasm. Many of them had been with us at the March for life in Washington and some had been with us at World Youth Day in Rio de Janeiro in 2013. 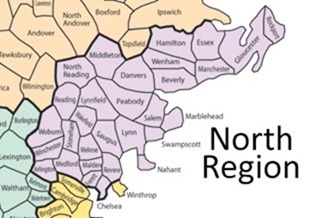 I have been meeting with the Vicars Forane of the different regions, and on Monday I had a meeting with those from the North Region and Father Petringa, who is the Episcopal Vicar for the region. 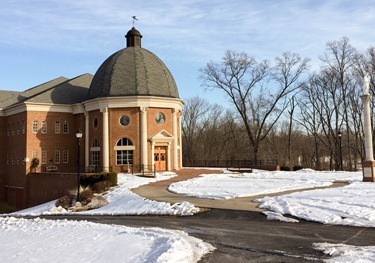 We met at St. John’s in Peabody to discuss the state of the Church, pastoral planning, the spiritual life of the priests, and any other issues they wanted to raise. It was a very good discussion. 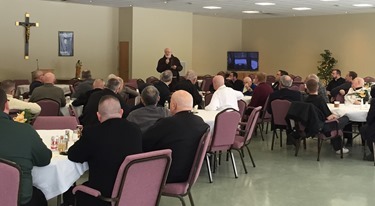 Wednesday, I joined a Lenten retreat for the priests of the Merrimack Region the Oblates’ house in Tewksbury organized by Bishop Hennessey. 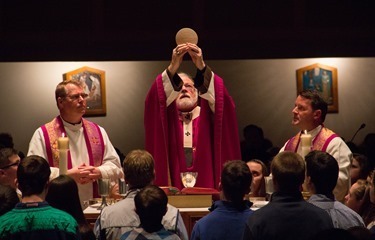 There were about 60 or 70 priests in attendance. 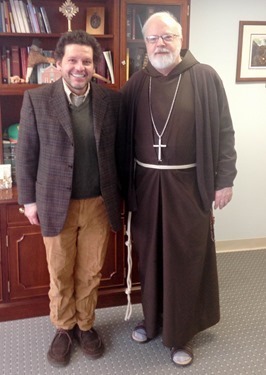 Also that day, I had a meeting with Tim Flanagan of Catholic Leadership Institute. He came to speak to me about some of their latest projects and initiatives. 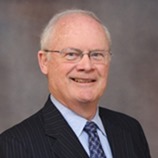 We are very pleased that John Corcoran, who is very active here in the archdiocese, will be the latest addition to their board. 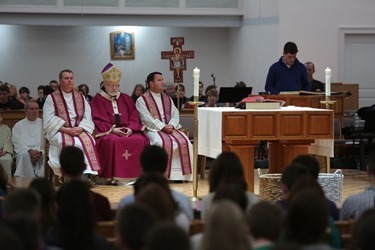 This new Mass will also be aired at various times during the day on Sunday because we know that, particularly in our immigrant communities, people need to work on Sundays, so it does give them additional possibilities to be able to see the Mass. Thursday I was visited by Pablo Eduardo, whose father used to be the editor of my newspaper, El Pregonero, in Washington D.C. 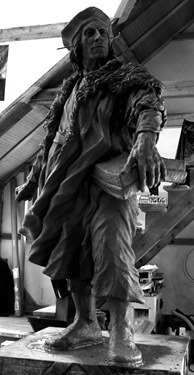 So, I have known Pablo since he was a child and now he is a renowned sculptor. 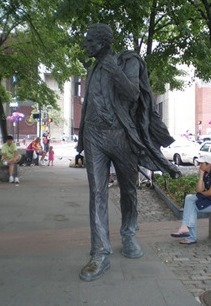 For example, he has created statues of St. Ignatius and St. Thomas More at Boston College, and the statue of late Boston Mayor Kevin White near Faneuil Hall. Lately, he has been doing some work at the former Crystal Cathedral, which is now Christ Cathedral of the Diocese of Orange, California. 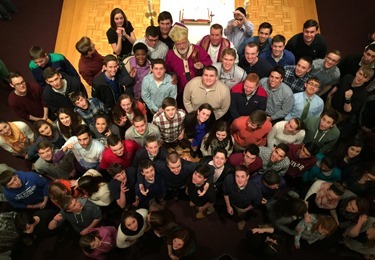 Finally, I want to remind all my readers in the Archdiocese of Boston that this weekend is Commitment Weekend for our annual Catholic Appeal. The spiritual and charitable works of the Church are so important and yet, they depend in great part on the resources — both human and material — that are supported by our Catholic Appeal. I am so encouraged to see that last year we had an increase of over 9,000 people who participated in the Appeal. It is a great sign that people are becoming more aware of the important work they are supporting through their donations. 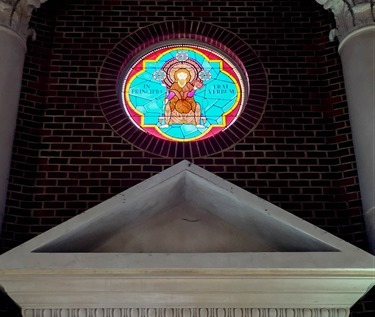 This weekend, as you hear the Appeal message in your parish, I invite you all to prayerfully consider joining your fellow parishioners who support the important work of the Church in the Archdiocese of Boston through their contributions.